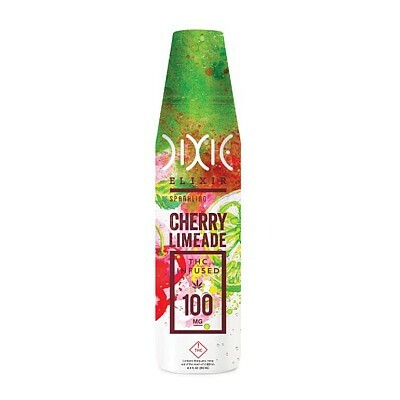 Dixie Elixir's Cherry Limeade Elixer combines juicy, plump cherries and tantalizingly tart lime with fine extracted cannabis of the highest quality. Each refreshing bottle of Cherry Limeade Elixer offers 100mg of the highest quality cannabis with 6mg per serving and 200mg bottles with 12mg per serving, allowing you to enjoy your Cherry Limeade at your pace. Crafted from pure cane sugar and all natural ingredients, Dixie Elixer's Cherry Limeade is free of artificial coloring and flavors. Their specializing designed homogenization technology increases the bioavailability of their cannabis, reducing uptake time and improving over effects. Packaged in their exclusive child-resistant bottles formulated to maintain perfect carbonation and flavor, Dixie's Cherry Limeade Elixir offers utter bliss with every sip. INGREDIENTS: Carbonated Water, Pure Cane Sugar, Natural Flavors, Citric Acid, Gum Arabic, Guar Gum, Natural Red Color, THC Oil, Potassium Sorbate [preservative], Quillaja Extract [emulsifier].